Dominic Golding is the Ability Rights Coordinator at RISE: Refugee, Survivors and Ex-Detainees and recently released an advocacy report titiled, ' Ex-detainess, asylum seekers and refugees with disabilities: our needs and perception of disability.' Dominic joined the show to talk about the report, the systemic barriers that refugees and asylum seekers with disabilities face when accessing support, and the change that needs to occur. 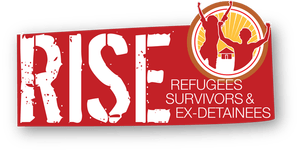 RISE: Refugees, Survivors and Ex-Detainees is the first and only refugee and asylum seeker welfare and advocacy organisation in Australia, entirely governed by refugees, asylum seekers, and ex-detainees. To support the work of RISE and to donate, you can visit their website. You can also follow RISE on twitter and facebook.